McFaul spoke at an IOP event last Thursday. Former U.S. 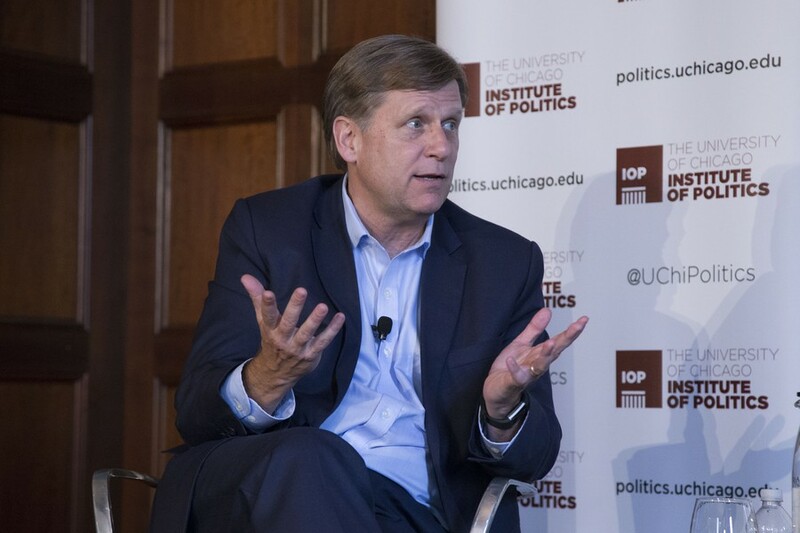 Ambassador to Russia Michael McFaul discussed his experience in dealing with U.S.–Russia relations under President Barack Obama last Thursday at an Institute of Politics (IOP) event. The event was moderated by Julia Ioffe, a political journalist at The Atlantic. He argued that the biggest common misconception about the “reset” policy is that it meant “selling out” to the Russians. Instead, he suggested that the goal of the “reset” was never to curate a good relation, but to deliver concrete outcomes that would make America better off. “The idea of the president was: Let’s not get hung up on baggage from the Cold War, or personality stuff, or cultural things. Let’s just find interests that are in common and achieve win-win outcomes,” McFaul said. McFaul argued that some substantive results were achieved by the “reset” policy. He cited as evidence the fact that both the United States and Russia reduced their deployed nuclear warheads by 30 percent in 2010 and that the two countries worked together to pass a series of sanctions on Iran for its nuclear activities as evidence. “It was really tragic that the ‘reset’ later broke down, and I think that ascribed to two mistakes that the Russians committed—not us,” he said. The first of these mistakes was the return of Vladimir Putin to the Russian presidency in 2012, McFaul claimed. Unlike Dmitry Medvedev, under whom the “reset” policy was launched, Putin was much more hostile to the West, and the United States in particular, according to McFaul. “Putin had a very different view of the world [than Medvedev], as a zero-sum game—not a win-win”, McFaul said. McFaul also said that the shift from Medvedev to Putin had a larger impact than is commonly believed. He argued that Medvedev was more than a “puppet” of Putin’s because the former Russian president often disagreed with Putin on important matters. After assuming the presidency for the second time, Putin never cooperated with the U.S. on international affairs as much as Medvedev did, McFaul added. As McFaul saw it, Russia’s second mistake was imagining the United States as its eternal enemy. He said that Putin was paranoid by the U.S.’s attempt to overthrow regimes, and the large anti-Putin demonstrations across Russia in 2011 added to that fear. McFaul claimed that no matter how American diplomats tried, they could not convince Putin that the Obama administration had no intention of ousting him. He added that setting America as an enemy is in Putin’s interest, because Putin needed a visible enemy to mobilize his base and marginalize the opposition inside Russia. McFaul also noted that there were several things the U.S. could have done better in order to maintain good relations with Russia. He proposed that America should have done more to help the Soviet Union transform into a democratic Russia. McFaul thinks that it is wrong for Americans to think we won the Cold War—he argued that the collapse of the USSR was possible because Russians demanded a democracy. Many diplomatic policymakers have adopted Francis Fukuyama’s “end of history” argument, which states that all countries will become liberal democracies automatically, without the need of any push. Therefore, the United States did nothing to facilitate Russia’s huge transformation toward a democracy with free-market capitalism, McFaul explained. However, Russia’s transformation to a democracy didn’t proceed as expected, and was instead disrupted by the rise of Putin. This turn of events, McFaul argued, was caused by a lack of sympathy in Russia for democratic principles, free-market capitalism, and the rule of law. In retrospect, McFaul believes that the United States should have aided Russia’s post-Soviet transformation by funding civic education in the country on a massive scale. He compared such a program to the Marshall Plan, which facilitated Europe’s democratization and reconstruction after World War II. McFaul also discussed NATO expansion after the collapse of the Soviet Union as a source of anxiety for the Russian government, although he believes Putin is only using it as a propaganda instrument against America.